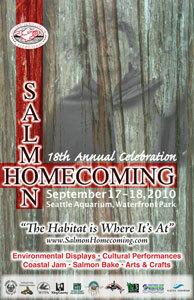 The Salmon Homecoming Alliance (SHA) is non-profit founded in 2001. Salmon Homecoming Celebration, an annual event hosted in Seattle, honors the fall return of the salmon and introduces local families to Native American culture by providing traditional celebrations and a holistic program of related environmental education activities. “School Days on the Waterfront” is a vital part of the Salmon Homecoming Celebration. Hosted at the Seattle Aquarium, 4th and 5th grade students from Seattle and beyond will spend a full day touring educational booths, listening to Native story tellers, and being a part of cultural sharing and community. We are currently recruiting tribal student participation for our 2010 event. School Days on the Waterfront will be hosted in two one-day programs at the Seattle Aquarium. We are requesting that schools who are in King and surrounding counties participate on Thursday, September 16, 2010. Students from more distant communities are invited to participate on Friday, September 17, 2010, to ease with time constraints. Programs who wish to attend on an alternate day can work with Salmon Homecoming Alliance Staff directly. SHA will work hard to accommodate all students. This year’s theme is “Habitat is Where It’s At”. Curriculum will be focused on positive environmental practices, developing an understanding of proper salmon habitat, and reinforcing the importance of our local environment for the health and safety of our community. Local agencies, including the Seattle Art Museum, nature conservatory groups, and the City of Seattle’s Restore our Waters program, will guide students on their educational journey. Students will be expected to participate in the full day of activities. Students should bring a sack-lunch. Transportation will not be provided by SHA, however, opportunities for SHA grants to help ease costs may be available to your program. Please contact us directly for more information. As a tribal program, we are also extending the opportunity to share your work through a display to be set up in the registration hall. We expect over 300 students and staff to participate each day. This is a unique opportunity to promote any upcoming events or showcase student success. We sincerely hope that you and your students will be able to join us this year. We give thanks to our sponsors for making School Days on the Waterfront happen this year!